in the heart of Rapid City, which is conveniently located on the edge of the Black Hills with easy access to the airport or interstate. 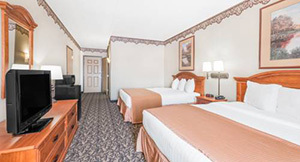 We will reserve a standard room with two queen sized beds, full bathroom, TV, micro/fridge, coffee maker, iron/ironing board, hair dryer, and radio. This award winning hotel features an indoor pool, 2 hot tubs, exercise room, guest laundry and deluxe continental breakfast. Head downtown to experience world class museums, wildlife attractions, amusement parks, monuments, public parks and more! atop Terry Peak overlooking thousands of acres of Ponderosa Pine and only minutes away from downtown Deadwood and Spearfish Canyon. 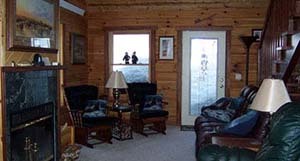 You will stay in a 3-bedroom private log cabin with two private bedrooms with queen bed in each, semi-private loft area with a queen and two twins, bunk beds, two bathrooms, full kitchen, TV, game room, fireplace, huge deck with hammock and grill and hot tub. There is plenty of room for the whole family, but quaint enough for a romantic getaway. Sit in the hot tub and breathe in the fresh air or just relax in front of the wood-burning fireplace - you'll feel so at home you might just move back! in the Hill City/Keystone area, just minutes away from Mt. Rushmore at a beautiful resort set amongst the ponderosa pines. Check-into a 2-Bedroom rustic cabin with one double bed and two twin beds, private bathroom and a wood burning stove/fireplace. This resort has almost any activity you can imagine: a water park, playgrounds, volleyball/softball/soccer/basketball, fishing, heated pool, game room, mini golf, paddle boat rentals, horseback riding, hayrides, evening movies, variety shows and an evening shuttle to the night lighting ceremony at Mt. Rushmore & Crazy Horse. Nestled over 250 acres amidst towering pines and along rolling meadows just eight miles south of Rapid City, South Dakota. From the comfort of your vehicle, you can watch as local bears frolic in a pool, climb trees and amble across the road in front of your vehicle. Your three mile drive will also include encounters with elk, reindeer, deer, cougars, bobcats, rocky mountain goats, bighorn sheep, dall sheep & buffalo. 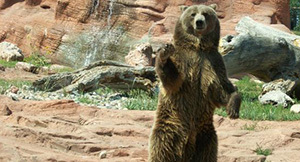 You will want to allot approximately 2 hours or more for touring the wildlife park. 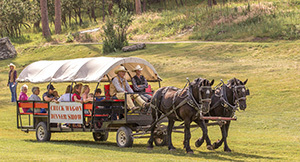 Travel into the Black Hills National Forest to a picturesque chuck wagon campsite nestled off the beaten path in a remote mountain meadow, with beautiful views of Harney Peak. Enjoy a fantastic Steak dinner (cooked to order) over an Aspen wood fire, including Dutch oven prepared side dishes, desert and beverages, sit back at a cracklin’ campfire, and listen to a great cowboy music show. This trail ride offers a great perspective of the Black Hills National Forest. 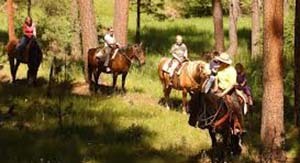 The topography of this ride allows you to relax and enjoy the scenery while your horse covers more ground in less time. 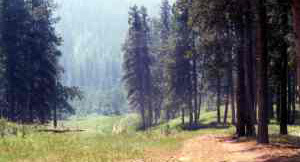 The forest is more open showcasing grassy meadows and great views of Harney Peak and Elk Horn Ridge. Trip leaders are mature, knowledgeable guides with years of expertise in the field, they are comfortable with people and have life experience in the local area. Ages 6 and above only. 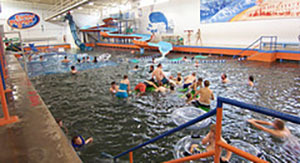 Spend a refreshing, fun-filled day at the World’s largest natural warm water indoor swimming pool. Try three different waterslides, tarzan rings, fun tubs or relax in a gigantic pool filled with rejuvenating naturally warm mineral water (87 degrees F). The therapeutic “healing” water has soothed visitors for over one hundred years. Enjoy some quality time with the family or enjoy a full service health spa for some personal pampering.. This is a rare experience at a very old working gold site with an antique mining museum and modern placer mill. Your admission not only provides a historic tour of the mill, but also gold panning! Your guide will explain the science of gold panning and how to identify other rocks and minerals. Guaranteed to bring home gold! Expect to spend 2-3 hours..
will begin from atop Terry Peak, buried in the Black Hills National Forest. Your experienced guide will pick you up for a full morning of pure back woods adventure. Your route takes you through Spearfish Canyon with stops for a variety of waterfalls and up to Cement Ridge (6,647’) for unsurpassed views of the surrounding area. Lastly, you head to the eerie ghost town of Tinton and the remote mountain lake called Iron Creek Lake. Your tour guide, Jake, has been touring the Black Hills for over 40 years and can tailor this adventure to your personal preferences. A light deli-style lunch with snacks and sodas is provided. Our Triple Park Tour includes recommendations, directions and history for a driving and hiking adventure through the following areas.